Chapters: 1. Preliminaries. Supplement: Preliminaries. 2. Convex Bodies and Lattice Points. Supplement: Fundamental Theorems. Lattice Polytopes. Large Convex Bodies. Reduction Theory. Tiling. 3. The Critical Determinant, The Covering Constant and the Inhomogeneous Determinant of a Set. Supplement: Suprema and Infima over Lattices. Packing. Covering. 4. Star Bodies. Supplement: Boundary Lattice Points. 6. Homogeneous Forms. Supplement: Packing of Balls. Extreme Forms. Zeta-Functions. Homogeneous Minima. 7. Inhomogeneous Forms. Supplement: Covering with Balls. Product of Inhomogeneous Linear Forms. Inhomogeneous Forms. Geometry of Numbers in Other Spaces. 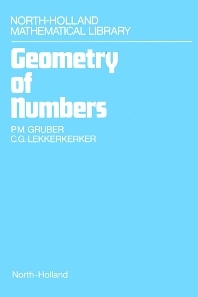 This volume contains a fairly complete picture of the geometry of numbers, including relations to other branches of mathematics such as analytic number theory, diophantine approximation, coding and numerical analysis. It deals with convex or non-convex bodies and lattices in euclidean space, etc. This second edition was prepared jointly by P.M. Gruber and the author of the first edition. The authors have retained the existing text (with minor corrections) while adding to each chapter supplementary sections on the more recent developments. While this method may have drawbacks, it has the definite advantage of showing clearly where recent progress has taken place and in what areas interesting results may be expected in the future.